Is a man who won’t divorce driving you crazy? Dating a separated man who is not yet divorced can be difficult. It’s time to get honest with yourself and get real about this situation. You met this great guy who seems to check all the boxes. You have a great time together and have fallen deeply in love. The problem is, he’s not divorced yet. At the start of things he acted like everything was underway, the divorce was imminent and just a matter of signing some papers. But time goes by and still no divorce. You start to worry. This is a time to re-examine your boundaries and the qualities you want in a man. I would think single and available would be at the top of the list right? If you are honest with yourself, is this situation really what you want and working for you? Not planning to divorce at all, just remain separated due to some financial implications, etc. Since you have no way of knowing the true status of his divorce, you are taking a massive risk getting involved with this man. If you fall in love, you’ll be attached to a guy who isn’t free to marry you (if that is your goal). Dating a man who won’t divorce can drag you down emotionally and be very painful. When a man admits he’s not yet divorced, you have a choice in that moment which is to move on or take a chance on him. Women often tell me they can’t help who they fall in love with, but that is not true. 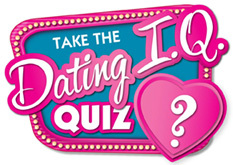 You can minimize these risks by NOT dating any man who is not yet divorced. In fact, most therapists recommend not dating a man who has been divorced for less than a year. It takes a long time to recover from the emotional pain and scars that are part of the divorce process. However, if you decide to go against current wisdom, there are the five painful facts you will have to face. Complicated financial issues (owning property, big inheritance, etc. I know a man who wouldn’t marry his new fiance because his (not quite) ex wife had worked for an airline and he was unwilling to give up her travel benefits. No amount of time , no matter how long you are willing to wait, will resolve some of these complicated issues. He may have his priorities and divorce isn’t one of them. Some men lie. You might be dating a married man who says he’s separated or getting divorced so he can date you and cheat on his wife. Maybe you have compassion for him because he painted a dreadful picture of his wife. You’re taken in by his charm. It happens. If papers have been filed, you may be able to find that online as a matter of public record. Similarly, completed divorces can be found. But not everyone gets legally separated before divorce and then there is no legal record. You are basically putting your faith in a man you just met, that he is ending his marriage. Does that sound worth the risk to you? This is how smart women get involved with a man who won’t divorce. If he’s been promising you that he’ll get divorced, what guarantee do you have? You can’t really check up on it and have to take his word. Ultimately, he has to want to dissolve the marriage and take the steps. His wife has to do her part and sign the papers. That’s a lot of hurdles to jump if you ask me. If he’s dragging his feet or avoiding the process, you can’t make him do anything. First of all, you certainly have no power over his ex. In most healthy relationships there is a balance of power, but not when you date a man who won’t divorce. You have nothing to negotiate once you are involved. When you date a man who won’t divorce, you are subject to his whims about timing and commitment. Once he tells you his situation, then you know the score. He can say he told you the truth. And you’ll have to deal with the fact that you chose to get to know him anyway. In a situation like this, the very best choice you can make is to walk away. A smart woman moves on to look for love elsewhere knowing he’s still married. Yes, you never know; things could work out easily. But how often does that happen? There is only one thing you can do and if you take this step, you must follow through or all is lost. Unfortunately, you have very little power in this emotionally charged situation. Your leverage is to withdraw your love and you deliver this as an ultimatum. However, if you tell him to, “Get divorced by x date or else,” you must mean it. If you back down for any reason, he’ll know you’ll put up with anything because you love him. Then all hope for moving your relationship forward is lost. Sometimes, no matter how much you both want it over, there’s nothing he can do to quicken the pace. Untangling a marriage can be complicated and go on for years. So, you have to decide if this relationship works for you or not as is. Sad as it may be, no matter how much you want to marry, be out in public or just have things finalized, you are not in charge and cannot exert your will. That’s why I recommend avoiding this emotional drama entirely. Simply say no thanks to dating a separated man. Yup, all of them – the entire category. 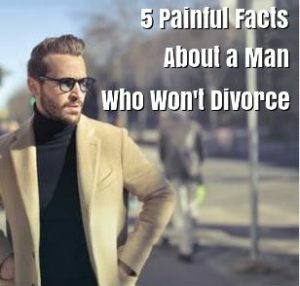 That’s the ONLY WAY you can avoid the tumultuous and heart wrenching problems related to dating a man who won’t divorce. Why open yourself to the craziness of someone else’s divorce? He’s not the only man out there! Instead, you want to meet men who have been divorced for years, who have never been married, or even a widower. You always have other choices and many that will turn out far better! 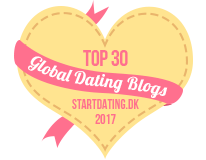 If you’re struggling to find the right man for the lasting romance you’ve dreamed of, lets have a conversation. Book a complimentary 45-minute call with me and fill out the short application. Good men do exist so let’s figure out what’s been holding you back. Dating After Divorce: How Can I Tell If He Used Me? Divorce and Dating: Why Don’t Men Ask Me Out? Hi Dina, It’s only a problem if he let’s them get in the way or uses them as excuses for how he lives and makes his decisions. If he said they hold him back – yes it’s a problem. But if they are a healthy family co-existing, that could be warm and lovely. Do you have any comments about dating a man that s indeed divorced, but has grown children living with him that will not move out?? I kinda find that just as bad!! Why Can’t I Find Love?